Douala is the largest city in Cameroon, and the capital of Cameroon's Littoral Region. 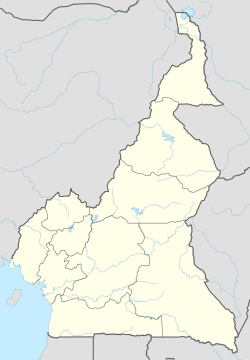 Home to Central Africa's largest port and its major international airport, Douala International Airport, it is the commercial and economic capital of Cameroon and the entire CEMAC region comprising Gabon, Congo, Chad, Equatorial Guinea, CAR and Cameroon. Consequently, it handles most of the country's major exports, such as oil, cocoa and coffee, timber, metals and fruits. As of 2010 the city and its surrounding area had an estimated population that surpassed 3,000,000 inhabitants. The city sits on the estuary of the Wouri River and its climate is tropical. Douala (German: Duala) is the largest city in Cameroon, and the capital of Cameroon's Littoral Region. Home to Central Africa's largest port and its major international airport, Douala International Airport, it is the commercial and economic capital of Cameroon and the entire CEMAC region comprising Gabon, Congo, Chad, Equatorial Guinea, CAR and Cameroon. Consequently, it handles most of the country's major exports, such as oil, cocoa and coffee, timber, metals and fruits. As of 2010 the city and its surrounding area had an estimated population that surpassed 3,000,000 inhabitants. The city sits on the estuary of the Wouri River and its climate is tropical. Settlements had already existed in present-day Douala prior to the arrival of the Portuguese, British, and Germans; however, it was during the German colonization that the city began to develop rapidly as a commercial and political hub of the German colonial administration. During World War I a bitter battle was fought for control of Douala. The city surrendered to British and French forces on September 27, 1914. A joint Anglo-French condominium governed the city until a comprehensive agreement ceded it (and much of Cameroon) to the French. After the independence of Cameroon, Douala grew rapidly. Local industries, trade, and other opportunities have attracted an unprecedented influx of migrants, especially from the western region of Cameroon. People from other countries in the region have also permanently settled in the city; they include Nigerians, Chadians, and Malians. In recent times city authorities have been overwhelmed by rapidly increasing population; services are stretched and there is an urgent need to enhance the city's ability to cope with the rapid growth. Douala is the first city in tropical Africa to have a piped natural gas supply (presently serving only industrial customers). It was ranked in 2015 as the most expensive city in Africa. It has had the highest standard of living among all African cities for the majority of the last 40 years. A very high number of European, American and Asian expatriates live in the city due to its highly developed infrastructure and peaceful environment for successful business and good life. 6 Truths About Living in Douala, Cameroon | Plus A Short True Story! I hope you will enjoy the video and may be oneday, you will visit Africa. Why not you ! DOUALA 2016 PART 1 Cameroon ETRvideo. Voici quelques-unes des autoroutes urbaines et des boulevards de la ville de Douala. Douala compte environ 4.5 millions d''habitants aujourd'hui en 2019. LANDING IN DOUALA CAMEROON DURING BAD WEATHER AND RAIN.